Media Size Choose an option18" x 24"22" x 28"
A neighborhood teenager, now a young man who’s been all around the world and has fought to stay alive. He packed his bags and boarded the plane like any good soldier completing his tour of duty. A troop transporter brought him home safely. 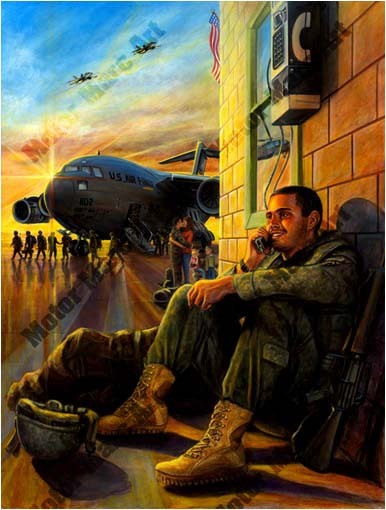 After touching down on the soil of hallowed ground, he takes a moment, and makes the call. A father waits upon a son, a wife looks forward to a warm embrace and a mother’s prayer evokes a tear to trace. His voice … I’m Coming Home. Inspired by reading a friend’s letter that his son was coming home from overseas. “Motor” Marc’s tribute painting honors the brave soldiers that are coming home and inspire the true meaning of family bonds and our freedom. 18" x 24", 22" x 28"